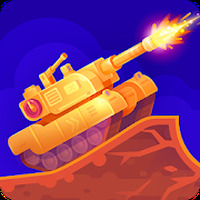 "Take part in an engaging battle as you destroy your opponent"
Game Goal: Command tanks in intense battles and shoot your enemies until they exhaust their energy. How to Play: The game features turn-based combat. The player must calculate the distance and power of the attacks while avoiding enemy missiles. Game play: Play alone or participate in matches against other players online. Get new tanks, improvements, and more powerful weapons. Installation requirements: A minimum of 95M of free memory space and Android 5.0 or higher. Rating: The TOP 1 Most popular games in War Strategy Games category. You'll need to spend some time calculating the distance in order to get the most out of your shots. You'll also need to move around quite a bit to avoid being hit by your opponent. The gameplay is simple. If you search on YouTube you'll find videos that show you how to play. A fun way to pass the time. Allows you to play against friends and other users online. It can be a bit repetitive. Do you like Tank Stars?